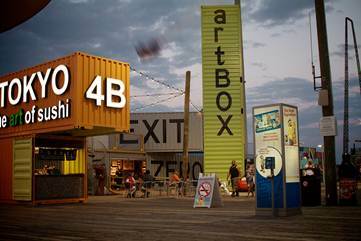 Morey’s Piers, located on the boardwalk in the Wildwoods, NJ, is embarking on a new artistic journey this summer with the introduction of artBOX, a 10,000 square foot interactive artists’ colony crafted from 11 re-purposed shipping containers featuring five local artist studios, a café serving fresh sushi, a museum shop, and live musical entertainment. A cultivated departure from the traditional seaside amusement park offering, artBOX has “curated” a selection of handpicked local and regional artists to bring texture to the visitor pier experience from showcasing paintings and handmade crafts to live demonstrations that include surf art, glass blowing, artisanal jewelry and speed painting. Guests will enjoy live, nightly musical performances starting late June through August. As part of the opening celebrations, 11 year-old artist and child prodigy Autumn de Forest will visit artBOX and Morey’s Piers on July 2nd to unveil a tribute painting created to honor the rebuilding efforts after Hurricane Sandy. Coinciding with Autumn’s exhibition at Ocean Galleries in Stone Harbor, NJ, this charity painting will be auctioned off with 100% of the proceeds going to the Hurricane Sandy NJ Relief Fund. A giant replica of the commemorative piece of art will be unveiled on the outside of artBOX’s only vertical shipping container standing 40 feet tall on July 2, 2013 at 2:00pm. Ed Pehota, a professional speed painter from Sewell, New Jersey with more than 30 years of experience as a pictorial billboard artist. His speed painting demonstrations have drawn thousands of spectators around the country and on YouTube. Hong Pehota, a Vietnam-born artist who creates a unique line of beautifully hand-painted glassware and jewelry. David Macomber mixes traditional pop and modern street art with his long relationship with the ocean creating his own artistic style known as “Urban Nautical.” Unlike conventional “surf art” where artists draw the perfect wave or tropical destination, Macomber tells the story of the sea that allows people to remember their experiences with the waves and weather. Pete Beilings Sr., a local artist from Burlington, New Jersey who specializes in painting traditional seascapes. Pete Beilings Jr., also from Burlington, New Jersey will showcase his glass blowing and sculpting techniques with stylishly crafted glass art pieces. School of Rock’s performance program will bring featured bands of regional young musicians playing a variety of music genres. 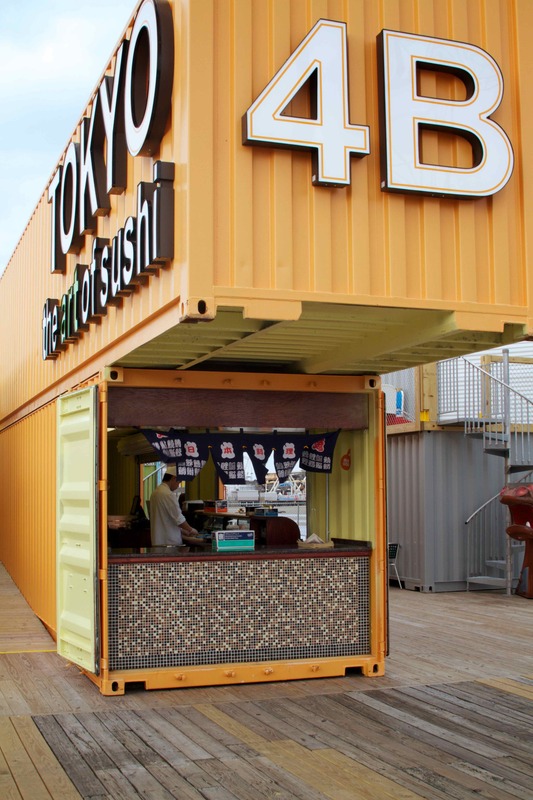 Located on Adventure Pier at Spencer Avenue and the Boardwalk, the shipping container colony also features the Exit Zero Museum Shop and Tokyo 4B [the ART of Sushi], a café serving a variety of fresh sushi. Menu items include Seared Ahi Tuna, California Rolls, Spicy Tuna Rolls, and specialties such as the Ocean Roll featuring spicy crab meat topped with lobster. Serving as Director of artBOX is Jack Wright, publisher of Exit Zero Publishing. As owner and operator of the Exit Zero Museum Shop, Wright has curated quirky amusement artifacts, nostalgic memorabilia and an eclectic array of retail merchandise. artBOX is open to the public daily from 4:00pm to midnight. For more information on Morey’s Piers, visit www.moreyspiers.com.